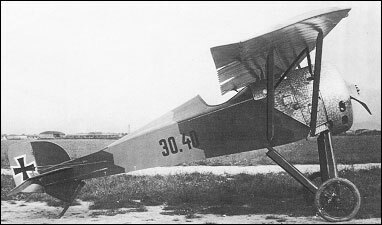 A parasol monoplane derivative of the Aviatik 30.27, the Aviatik 30.40 was powered by a similar 160hp Steyr Le Rhone 11-cylinder rotary engine, and only one prototype was built and flown during the summer of 1918. The Aviatik 30.40 was of wooden construction. The forward fuselage was covered by light metal panels and the remainder of the fuselage was ply covered. The wing had fabric skinning, and steel-tube bracing struts were employed. The wing had fabric skinning, and steel-tube bracing struts were employed.